What is your name? -> I`m Doraemon. How did you find us? -> I found out about this conference from Nobitasan. Why do you want to join this conference? -> I am here because I want to speak more English. Meow! Our story began back in December 2013 and since then, 1000 Speakers Conference in English has always been a sandbox for those with limited opportunities to practice presentation skills in English. Over the time, we have been staying true to our group name and kept growing in numbers toward 1000 participants. But, that was not our only goal per se. The vision drawn by our founder, Hiro “Robert” Yoshioka, was to make a difference in Japan and in the world by uniting 1000 forward-minded individuals. As of August 2018, we have been successfully hosting the conferences for over 300 people (and counting! ), joining us to share their ideas from all walks of life; Needless to say, our differences in age, gender, occupation and nationality have all been brought together and embraced through the use of English as our universal voice. Join us in our journey to make the world a better place as we improve our presentation skills in English! This is a place for people with limited opportunities to practice presentation skills in English. Discretion is advised if you are a proficient English speaker. All participants will have a brief self introduction. Should you choose to make a presentation, we recommend it to be 1-5 minutes in length. You may decide your own topic. Making a presentation is not mandatory. Feel free to join us as a visitor! First half of the presentation session is reserved for beginners, followed by the rest in the second half. A projector will be provided. The timetable including the time for presentation is subject to change. You are welcome to bring foods and drinks. Our policy is “BYOB” (Bring Your Own Bento). The Japanese version of FAQ is for novices making presentations in English. As you read in “HOW TO JOIN US,” this is a place for people with limited opportunities to practice presentation skills in English. If you are reading this, it is more than likely that you are a proficient English speaker and your support toward the beginners is extremely valuable. Obviously there are more tips on this matter but let's just keep in mind that we all had a time in our lives when we were beginners and struggling. Your help to make this community a nurturing place for ALL of us is greatly appreciated. Thank you very much! 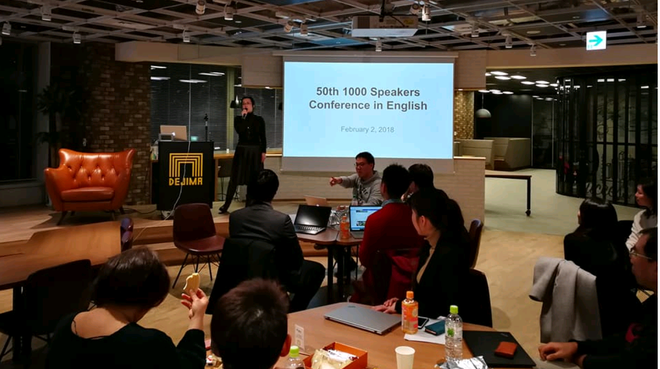 Miho published 1000 speakers conference in English 69th, FEB. I joined 1000 speakers conference in English 69th, FEB!